Why would someone pay a service to basically input information into a template? Because the time savings are significant. We've all heard that time is money, and in this case, money can be time. 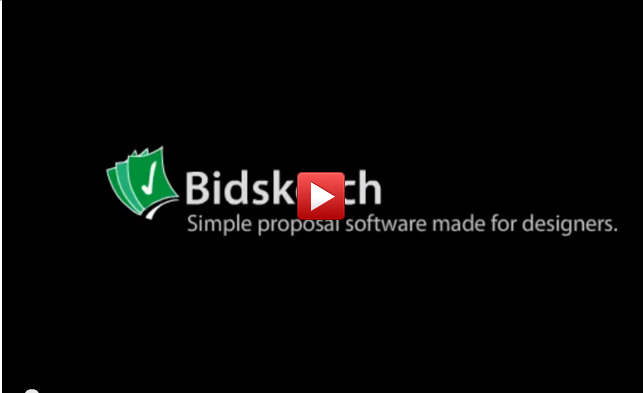 Bidsketch is an online application which aggregates information and ideas into a self-populating database of sorts for making proposals. It cuts out the time and complication of changing existing proposal templates and starting from fresh. According to the testimonials on the website, the program cuts design time by more than half for most users. We at Sprk’d found it incredibly user-friendly and logical, and made a sample proposal in about 25 minutes by manipulating sections with ease. The time savings are obvious. But what makes this good product great is its innovation in the proposal sphere. Perhaps the coolest feature is the notification the creator gets when a client actually views the proposal, and even cooler, it tells you how long the client spent engaged on your piece. The most interesting feature is the setup of the site itself. When viewing a proposal, a client can review and come to a decision on the same screen. This concept creates a type of accountability pipeline that is currently lacking in the proposal space. Viewers can add comments, and most progressively, accept the proposal on condition, i.e. accepting the proposal save a few sticky issues. This can cut tons of time out of the negotiation process and notify the user of what needs to happen for the deal to move forward. The program also generates success rates and other analytics which allow you to pinpoint where you went wrong – or right throughout all of your proposals and clients. Lastly, it has a real entrepreneurial vibe. This program was clearly developed to benefit designers and creative minds in shaping their vision into a polished piece. While allowing for the customization artists love, the reliable business edge add professionalism and organization. You can access pre-made templates or code your own with simple HTML or CSS. Furthermore, you can customize your domain starting at the $29 per month plan, removing any of Bidsketch’s branding and allowing clients to focus on your vision. For any entrepreneurs out there who generate invoices often, take note of Bidsketch’s integration with FreshBooks. For example, if a client approves certain services and agrees on a price, those line-items can be sent to FreshBooks for quick billing. The program uses a self-proclaimed “pattern of persuasion” to order sections and information in its templates. Though we’re not too sure about that, the fact that the proposals self-populate from a database of information entered by the user is awesome. There are three price points -- $19, $29, and $99 a month. The most basic plan allows for up to 25 different clients, 1 user, 1 GB of storage, templates, branding, PDF exporting, and basic analytics. The next plan up expands to 2 GB of storage, an unlimited number of clients, and the added features of an electronic signature and a customized domain for your proposals, but is still limited to just one user. The biggest plan allows for up to 10 GB of storage, up to 5 users, and the added bonus of managing user profiles. It’s a simple, logical, and beautiful solution to the disorganized world of proposals. If you’re interested, check out the free 14 day trials of each price point at http://www.bidsketch.com/pricing/ or see the walkthrough below.